We have just finished posting videos of all of the sessions from FlashCamp San Francisco. You can view all of the sessions here. Ill post the other slides as I get them. We have just posted the video and slides for the FlashCamp San Francisco keynote, by Kevin Lynch CTO of Adobe, and David Wadhwani, GM and VP of the Flash Platform business unit..
You can view the video here, and grab the slides from here. We will be posting the rest of the videos and slides through the week. Just a couple of last minute notes for tonight’s FlashCamp San Francisco event. FlashCamp San Francisco is in two days! FlashCamp San Francisco is just 2 days away, and I wanted to make a quick post to remind everyone about it, as well as give some additional information about the event. FlashCamp San Francisco is now sold out. We were really blown away how quickly all of the spaces filled up. If you didnt get a chance to register, then keep an eye on the event page in case there are any cancellations (we won’t be doing a wait list). Also keep an eye on the FlashCamp twitter account, as we will post them when / if tickets open up. We are also planning on videoing the event, so you should be able to check it out the following week. Update : The event is sold out. We have just posted information about FlashCamp San Francisco, a free developer event that we will be holding in the Adobe San Francisco Office on Friday night, May 29th. This will be similar to the ApolloCamp event that we held for the Apollo Beta launch a couple of years ago, although this event will be focused on the next generation of Flex, including Flex 4, Flash Catalyst, and Flex Builder 4. FlashCamp San Francisco is a free one night event hosted by Adobe covering everything you need to know about getting started with building and designing rich Internet applications (RIAs) with Flex 4, Flex Builder 4 and Flash Catalyst. Richard Galvan, Product Manager for Flash CS4 tells us all about the new features and time-saving workflows inside the new release. Lee Brimelow, Flash Platform evangelist has made his Sunday Keynote available today — enjoy! Justin Everett-Church, Senior Product Manager for Flash Player has made his Keynote presentation available today — enjoy! 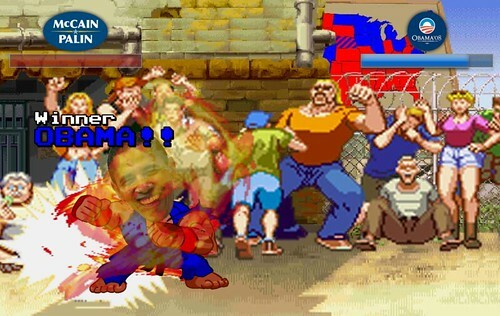 “Avenue Fighter 2008: Battle for the White House is a political fighting game that is controlled by the current tweets (messages) appearing on Twtter.com. Once running, the game scans Twitter for new tweets containing either McCain or Obama, and weighs the phrase as positive or negative. FlashCamps are developer events, focused on creating expressive content and applications with the Adobe Flash Platform. The next FlashCamp is FlashCamp San Francisco on May 29th, 2009. The event is sold out, but you can find more information on the event page. FlashCamp is an official Adobe event. © 2008 Adobe Systems, Inc.